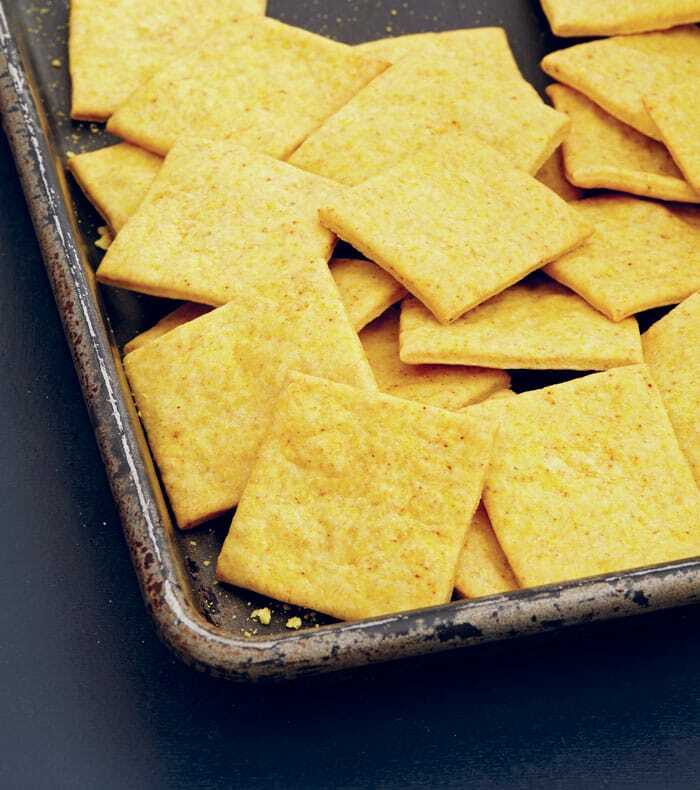 Home » snack » Vegan Cheesy Crackers from Veganize It! Vegan Cheesy Crackers from Veganize It! After you’ve been vegan awhile, you may find that you have cravings for foods you used to eat. I found that I wasn’t actually craving meat or cheese, but just really wanted some nostalgia veganized that hit a similar flavor spot. You see it again and again in vegan recipes for bbq, “ribs”, vegan cheese, and vegan crab cakes. Today’s recipe is a veganized Chez-it by Robin Robertson. A book that is chock full of make from scratch recipes that will quench and cravings you might have. You can make your own vegan butter, vegan meatballs, veggie burgers, bacon substitutes, condiments, sweets, and so much more. Be sure to look in the book on Amazon to be able to take a look at the table of contents it’s impressive! 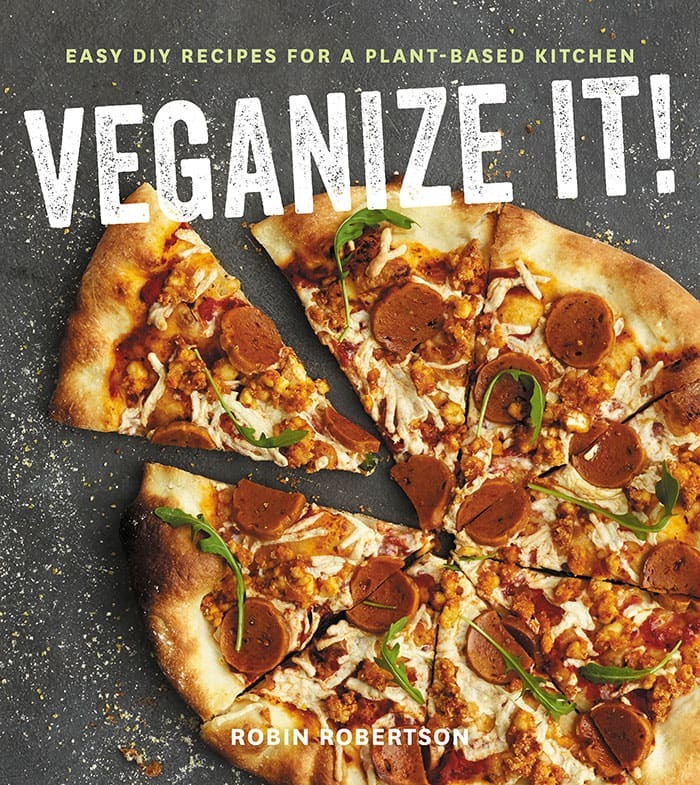 You can find this recipe and more in Robin Robertson’s new book, Veganize It! It’s easy to find crackers without animal ingredients, unless of course, your favorite crackers happen to be the cheesy ones. Now you can make them at home, complete with the delicious crunch and cheesy color and flavor you love but without the animal ingredients and additives. Preheat the oven to 350°F. In a medium bowl, combine the flour, nutritional yeast, baking powder, salt, garlic powder, smoked paprika, and turmeric. Mix well. Add the olive oil, butter, and lemon juice, mixing with a fork until the dough is fine and crumbly. Add the water a tablespoon at a time until the dough becomes cohesive. Bake for 15 to 17 minutes, or until the crackers are baked but not browned. The color should be golden. Cool completely on the baking sheet. These crackers keep well for a week in a sealed container at room temperature. Any way to make without butter and oil? Your bow tie chips are amazing. I took them to a plant strong potluck and people couldn’t believe they were made without oil. I wonder if awuafaba might work in place of the butter and oil in the Cheesy Cracker recipe.